A warm welcome to two gorgeous items designed exclusively for CB2. Charlene white wine cabinet, possibly the most beautiful bar in town. Elevating entertaining with some sleek cabinet equipment perfect for storing bottles and barware galore. Shiny, pretty Paloma Brass Bar Cart is a brass act and perfect to roll out for cocktail hour. Set atop modern casters the trio of shelves provide substantial storage from top to bottom. Both now available from CB2.com. We are please to announce that our gorgeous Carousel sideboard in now available in Europe and the US, or to be exact, Dallas Texas! Guggenhome - Where the art of living meets the art we live with. Carousel Sideboard, in Walnut and marble, available from Guggenhome. Carousel sideboard in the WeWood factory in Portugal, and also available in Oak and Marble. New to the shop floor is our Ropsten (aka Jedabo) writing desk. A compact and minimalist design, this desk can also function as a dressing table or console. The grey linoleum surface is soft and naturally sustainable product. Shop for Jedabo at Habitat Europe. (L-R) Jedabo writing desk, in Oak and grey natural lino, Saint James Writing desk, in Oak and Farringdon Laptop desk in Oak and painted white. Slope Bed is awarded a German Design Award Special mention for 2017! 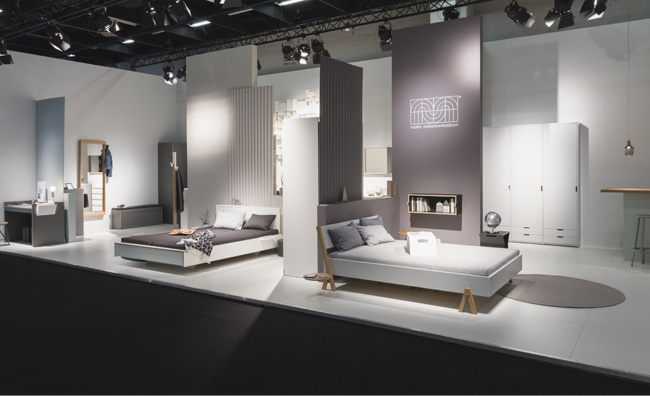 Oh my, we are delighted with the news that our Slope Bed, produced by German brand Müller Möbelwerkstätten has been award a German Design Award – special mention for 2017. The German Design Award is awarded to projects that truly represent pioneering contributions to the German and international design landscape and presents unique design trends: a competition that advances the design-oriented scene. Bestowed by The German Design Council the German Design Award is the highest authority to represent new developments in the German design industry.